The banner program is intended to provide pride in the community, add color and excitement to Topanga’s streetscape, promote community activities, special events, and other cultural or sporting activities, as well as promote programs important to the town’s image, economic interest and organizations serving the community. Special rental pricing is given to local Topanga non-profit organizations. Only a nonprofit organization may request permission to place banners for the purpose of promoting the organization or a special event that is held in or around Topanga, CA and be open to the public, or have a common interest to the general community, or recognize and/or contribute to the cultural fabric of the Town. Banners may not advertise or promote commercial products or services, or religious, political or social viewpoints; however, sponsorship names are allowed on the banners, but are subject to restrictions and design. There must be a direct connection between the banner design and the event. 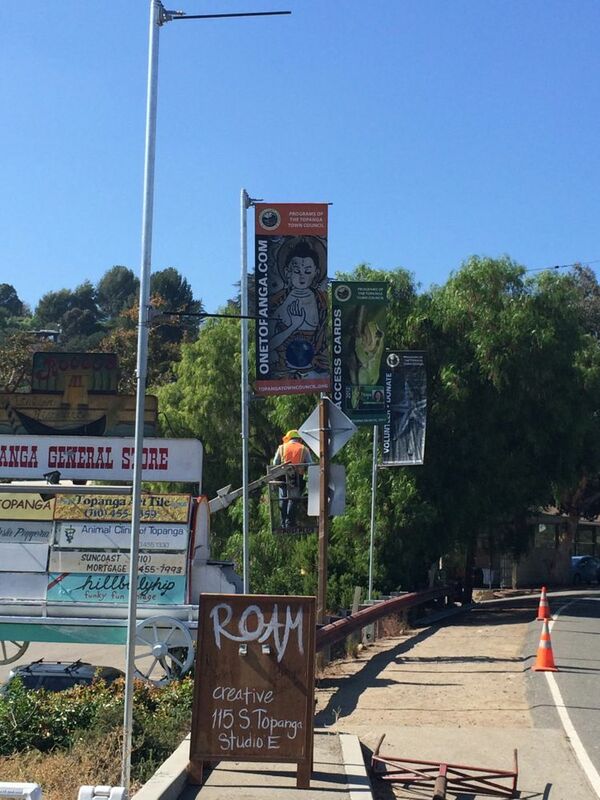 There are four (4) banner poles located on non-County property, street-side at 141 South Topanga Canyon Blvd at the General Creek Shopping Center, Topanga, CA. Banners are 3’x8’ vertical format. A permit is not required for use. Funds collected from banner pole rentals go toward programs and projects benefiting Topanga. Click here to see a list of current Topanga Town Council programs & projects.